"N-Cube" Insert Bag. 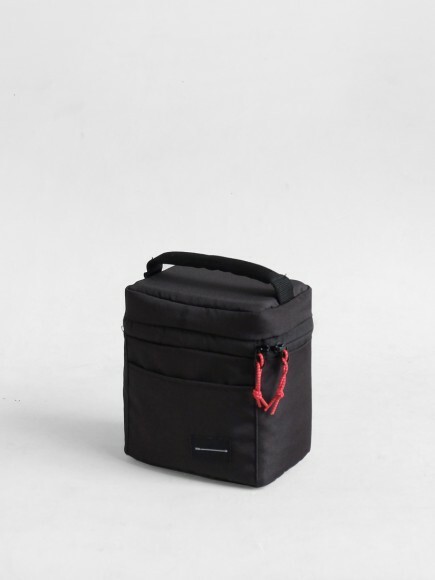 N-Cube is our refinement from our previous Cube insert bag, with zipper closure and weatherproof fabric to prevent your goods from dust or rain. N-Cube is the solution to store your camera, because sometime your camera-bag is too bulky to carry around all day. Insert Bag is a camera version of a laptop sleeve that turns every bag you own (backpacks, messenger bags, even totes) into a camera bag. Stay stylish & efficient. Fabrics: Coated polyester filament fiber padded with 8 mm polyfoam, waterproof inner lining, YKK Zipper. Colors: Black body, black nylon padded-handle strap. Features: 1 main compartment wih zipper closure, 1 inside pocket with velcro closure, red elastic puller.